Huawei today announced five new products, four are smartphones, all belong to the Huawei Mate 20 Series, and a new smartwatch, the Watch GT. The Mate 20 series encompasses the Mate 20 Lite, launched several weeks ago, and joined today by the Mate 20, Mate 20 Pro, The Porsche Design Mate 20 RS and the 7.21″ screen Mate 20 X. We expect the Mate 20 and Mate 20 Pro will be the biggest volume drivers so most remarks here will refer to those models. The Mate 20 X may get attention in some Asian markets as users seek to combine smartphone and tablet use cases. 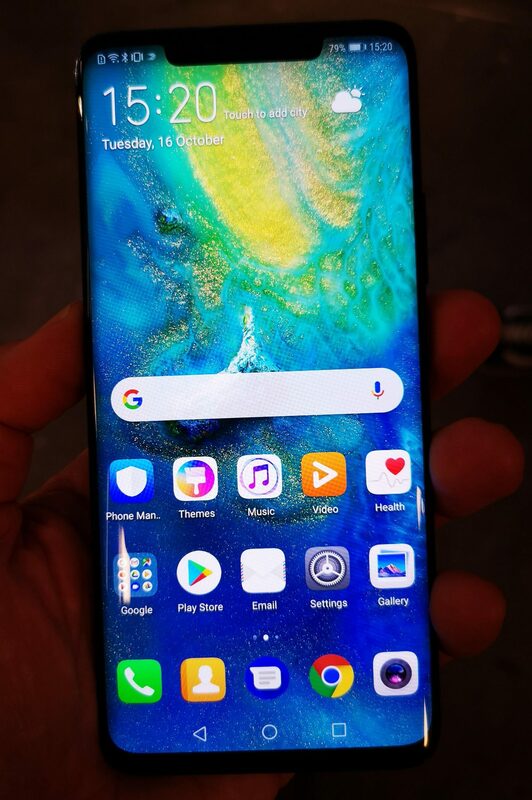 The Mate 20 Series (Lite aside) is the first Huawei product series to incorporate the HiSilicon Kirin 980 SoC that we reviewed at its launch at the IFA show in Berlin last month see here. The messaging around the Mate 20 series is a combination of power and design. In terms of design, Huawei has taken a significant forward step from previous Mate Series devices. These included large displays and many attractive design features but were quite hefty. The Mate 20 series all include displays over six inches in diagonal dimensions (6.39” and 6.53” for the Pro and Mate 20 respectively). The Pro has an OLED display with higher resolution compared to the standard Mate 20’s LCD, but both displays look good. Both also feature significantly curved edges, reminiscent of Samsung flagship devices. Huawei has developed a strong reputation for battery longevity. The Mate 20 series will enhance this still further. Huawei has Samsung firmly in its sights. The Galaxy S9 series and the Note 9 do not have great battery performances. The Note series is still trying to emerge from the shadow of the infamous Note 7 battery fire debacle. Its mishandling of that episode is, at least partly, the reason that Samsung’s market share in China languishes in the low single digits. And while not a direct competitor, Apple also has battery issues. During the recent iPhone launch, Apple proudly proclaimed that iPhone XS and XS Max will offer an incremental 30 to 90 minutes battery autonomy respectively over the iPhone X. While the live audience cheered and whooped, the rest of the world scratched its head in bemusement at Apple’s pride in barely shifting its battery performance from one end of mediocre to the other. In the Mate 20 Pro, Huawei has included a 4200mAH battery. With the efficiency gains from the move to the Kirin 980, this should be enough for outstanding battery performance. However, Huawei has upped the power of its SuperCharge-branded fast charger to 40W meaning 70% of the battery can be replenished in 30 minutes. In addition, and for the first time on one of its mainstream products, Huawei is supporting wireless charging using the Qi standard. However, again, Huawei wasn’t content with the trickle nature of wireless charging, so it’s gone for a fast charging version. And to add insult to injury, the Mate 20 can be used as a wireless charging pad to recharge other Qi standard devices that find themselves short of charge. The wireless charging dock will be sold as an accessory. To emphasise the safety of the batteries, Huawei has worked with the German product assurance agency TUV to certify the safety credentials of the product’s batteries. The Mate 20 series is getting a triple rear camera set-up similar to that on the P20 Pro. In the Mate 20 series, the three cameras are arranged in a square module with the dual-tone flash making up the fourth corner of the square. 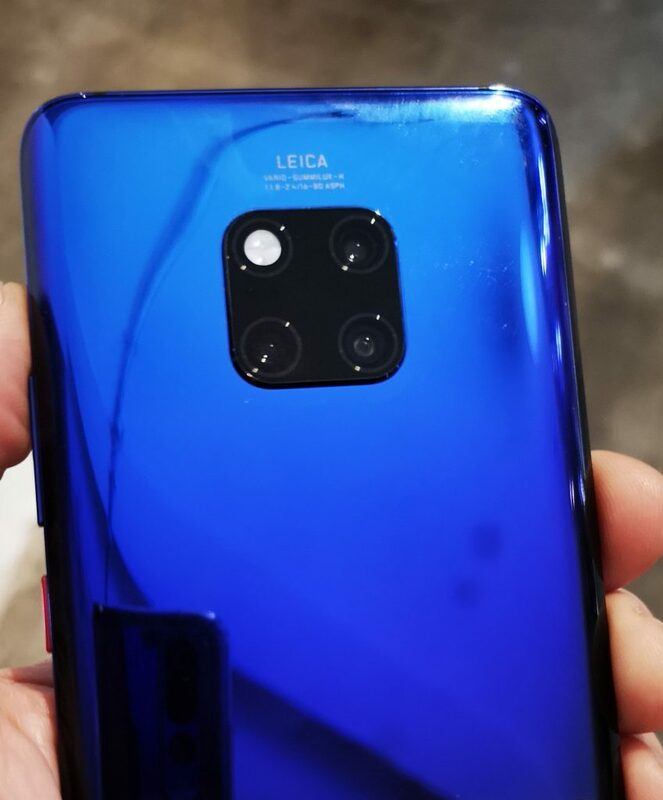 The cameras are set in the center of the back rather than offset as in the P20 Pro. But gone is the mono-sensor; Huawei substituting it for a super-wide-angle lens. This offers both very wide-angle shots and improves the camera’s ability to achieve macro-level close focus. We have been impressed with the B&W imagery shot with the P20 Pro. 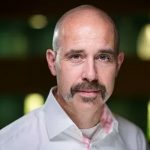 When asked, Huawei claims that it can still generate the powerful black and white images through software, thanks to work done with Leica. Biometric security features on the Mate 20 Pro have been significantly enhanced. The device gets a 3D depth-sensing module for face recognition. This is similar to that found on the latest iPhones. And the fingerprint sensor has moved under the display. In addition, the Mate 20 will have a password vault. The standard Mate 20 retains the fingerprint sensor on the back and doesn’t have the 3D facial recognition. 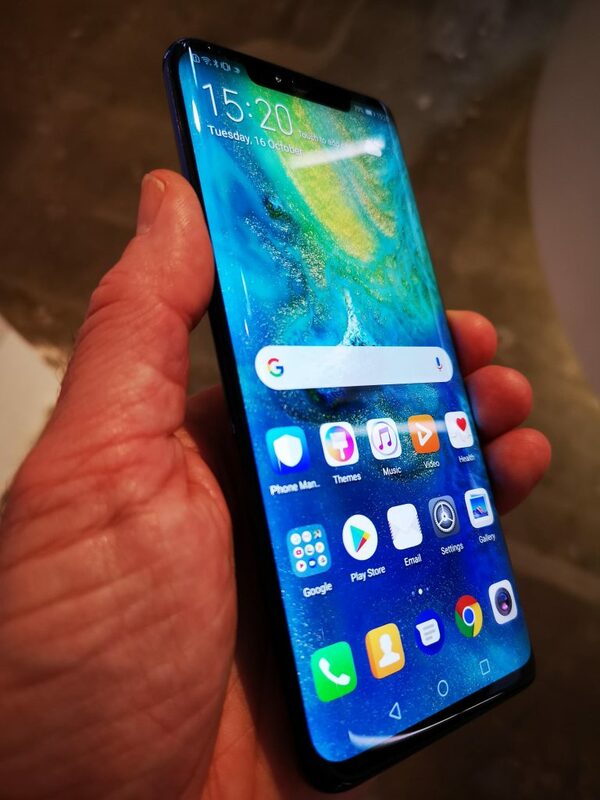 Instead, the notch is reduced to what Huawei calls a teardrop; barely larger than the front-facing camera. Huawei has done quite a lot of work around the enterprise usability of the Mate series including the ability to screencast wirelessly. In this mode, the screen of the phone acts as a touchpad. However Bluetooth accessories such as keyboard and mouse can be added. In our brief try out, it worked quite well but had a few glitches. The software environment has been significantly improved. EMUI, which has been steadily improving over the last few years, has been cleaned-up considerably with a massive reduction in the number of selectable and often confusing options. In addition, Huawei has been working on the computer vision aspects enabled by the, now dual, neural processing units. The device has been trained to recognise over 120 million items, which are linked through more than 200 e-commerce platforms. The goal is to enable the user to use the phone to recognise and buy various items. We remain to be convinced, as we were when Samsung introduced the idea with the Galaxy S9. In terms of pricing, Huawei is taking full advantage of the headroom that Apple is creating. The Mate 20 starts at €799 for the 4GB+128GB model, €849 for the 6+128GB. The Mate 20 Pro is €1049 for 6+128GB. The Mate 20 X looks like a bargain at €899. For the record, the Porsche Design Mate 20RS manages to make even iPhones look cheap as they tip over the 2000 euro mark for the 512GB version. The Huawei P20 Pro was the first Huawei model that felt like you were making no compromises in using it. It was justifiably widely praised by testers. Samsung should have been worried at that point. Apple needn’t have been overly concerned – it has always been unlikely a hardened iOS user will give a Huawei phone a second glance, despite Huawei besting iPhones on almost all performance benchmarks. We think the Mate 20 builds on what Huawei accomplished with the P20 series. Apple still needn’t be concerned, but Samsung should be in full panic mode.